SPRINT is free software; you can redistribute it and/or modify it under the terms of the GNU General Public License as published by the Free Software Foundation; either version 2 of the License, or (at your option) any later version. SPRINT is distributed in the hope that it will be useful, but WITHOUT ANY WARRANTY; without even the implied warranty of MERCHANTABILITY or FITNESS FOR A PARTICULAR PURPOSE. See the GNU General Public License for more details. README - Information about emulator of Sprinter computer. SPRINT.ZIP (513K) - Current state of work (C++ source code and binaries for Windows, Linux). This is NOT release! This is snapshot of my work directory! SPRINT.RAR (557K) - Current state of work in RAR. RARLINUX.GZ (151K) - Selfextracting RAR package with archive/unarchive binaries for Linux x86. ZMAC13.ZIP (82K) - ZMAC 1.3, public domain Z80 macro cross-assembler. C source code included. Excellent tool for making Sprinter binaries under Linux (and Dos ;). You will receive notification and you need reply on it. After that you will be subscribed on our mail-list. Good emulation. Viewing and editing don't work. Directory surfing don't work too. FLX plugins are working excellent. Window is painted, but mouse don't work. The program don't included at package. Excellent emulation. Sierpinsky triangle is simple fractal that may be painted by IFS. Excellent emulation. Pixels are flying from display center. Excellent emulation. String at bottom of display runs to the left. Excellent emulation. It's simply logo of Psycnosis that shows from black. Excellent emulation of my demoversion of CP/M-80 emulator. Screenshot shows XCCP.COM output. Excellent emulation. This code was made by RW1P2 cross-compiler. It's Just Another Tetris port to RW1 programming language. 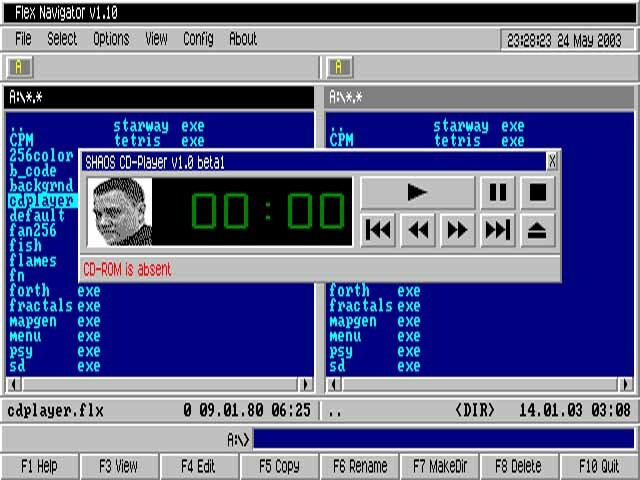 Emulator of russian computer "Orion-128"
Manufacturer of Sprinter computer "Peters PLUS Ltd."